Get relief from pain, depression, fatigue, constipation, nausea, loss of appetite, difficulty sleeping, anxiety, shortness of breath, and other symptoms that may be causing distress, serious illness due to cancer or any disease. No drugs, no side effects. Dr. Pardeshi Acupuncture Pain Treatment is providing addiction treatment effectively in Nashik in 5* clinic with modern facilities. What does palliative care mean – it means comfort care, supportive care, and symptom management for improving quality of life. It manages not only pain and sickness but also takes care of personal, social, spiritual issues related to disease. Palliative care is management of people who are suffering from the symptoms and stress of serious illnesses such as Cancer, Alzheimer’s, Parkinson’s, Amyotrophic Lateral Sclerosis (ALS)congestive heart failure (CHF), chronic obstructive pulmonary disease (COPD), kidney disease, and many more. What to expect from palliative support? Palliative treatment for cancer can be started at preferably at diagnosis but can be at any stage of illness, if there are bothering symptoms like pain or sickness. Palliative cancer treatment is given throughout a patient’s experience with cancer by palliative care team. Palliative care treatment should begin at diagnosis and continue through treatment, follow-up care and till the end of life. One important palliative treatment examples is, it can be used to control or reduce side effects of cancer treatment. Palliative care treatment can also be used for someone to live life better, even if cancer cannot be cured. 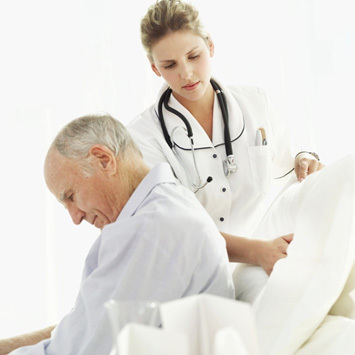 Palliative care examples are not limited to pain reduction or sickness management. They can be used get rid of other symptoms. Palliative care at home is right approach. Palliative care nursing can be best be provide by family members under guidance of team of palliative treatment providers. If that is not possible, hospice palliative care can be availed. Palliative chemotherapy can be used to shrink tumour to reduce pressure on nerves and surrounding tissue. Other examples are palliative chemo, palliative radiotherapy and hospice care. Palliative medicine used for this purpose can be hormone therapy, biological therapy. Palliative surgery like radiofrequency ablation can also be performed cryotherapy. Palliative treatments for cancer can be availed by any patient suffering from malignancy but some are more in common like - palliative treatment for stomach cancer, palliative treatment for prostate cancer, palliative treatment for pancreatic cancer, palliative treatment for breast cancer and palliative treatment for lung cancer. Says in its article... “Acupuncture is being increasingly used for a multiplicity of symptoms in patients with cancer and those requiring palliative care. An evidence base has been accumulating over recent years for symptoms such as acute and chronic pain, nausea and vomiting, xerostomia, vasomotor symptoms, fatigue and dyspnoea. Yet, anticancer treatment remains an intense experience for many patients and causes numerous side effects. Acupuncture, being a non-drug treatment, provides at least a partial solution for the increasing proportion of patients who turn to complementary and alternative therapies for help with symptom control at variable times after their diagnosis. Acupuncture has been used in pain management in our large Oncology Hospital for over 30 years; initially treating only pain but gradually also used in the treatment of non-pain symptoms such as hot flushes, dyspnoea and radiation-induced bowel and bladder problems. A wide range of symptoms have been treated with varying degrees of success, including radiation-induced proctitis and bowel problems, radio-necrotic ulcers (which classically never heal) and radio-necrosis of the jaw in patients on bis-phosphonates – some would make very interesting case reports still waiting to be written up. The majority of patients who are referred to us have more than one symptom needing treatment. This can present considerable challenges for clinical trials: for example, when trying to recruit participants, the inclusion criteria may demand a single symptom only, such as fatigue; however, the fatigue may in fact be caused by another problem such as disturbed sleep patterns from hot flushes. Studies that specify that treatment should be given only to the presenting symptoms, as with palliative care studies, could raise ethical difficulties. There is an argument for greater acceptance of pragmatic trials in this area to help influence medical opinion. It is not surprising to note the immediate effect of acupuncture on reducing global symptoms such as fatigue, anxiety and dyspnoea, in the pilot study of Lim et al when acupuncture was compared with nurse-led supportive care. While this is a somewhat uncommon comparison to choose and difficult to quantify in trial terms, no one can deny the importance of reducing these generalised symptoms at the end of life. We also notice that the analgesic effects of acupuncture wear off more quickly towards the end of life, in contrast to effects on other symptoms such as dyspnoea and vasomotor symptoms, and we often speculate on the possible mechanisms contributing to this difference. There are many fascinating unanswered questions in this clinical area. Also in this issue, Donald et al have used acupuncture in a retrospective case series for chemotherapy-induced peripheral neuropathy (CIPN) – a condition that has caused widespread morbidity and yet remains a relatively poorly researched area for which no standard effective medical treatment has been agreed on. They show that acupuncture can reduce these debilitating symptoms in their patient population, possibly through release of various endogenous transmitters including nerve growth factor, γ-aminobutyric acid and adenosine. Oncologists have altered dose scheduling recently, which has led to a reduction in the incidence of CIPN, though some agents such as bortezomib (Velcade) continue to give some of the worst symptoms in patients with multiple myeloma. It is encouraging to see that acupuncture may also be beneficial in helping to alleviate the troublesome symptoms associated with non-cancer conditions such as HIV where the gastrointestinal symptoms associated with anti-retro-virals can greatly adversely affect quality of life. Patient safety is of paramount importance in this group of patients who are particularly susceptible to the effects of acupuncture and who may have complex and ever-changing patterns of symptoms. For this reason, in 2006, we published guidelines for providing acupuncture treatment specifically for patients with cancer, which included contrasting advice about patients who are prone to or who have lymph-oedema, extending an earlier articleon patient safety and acupuncture. A significant number of patients with lymph-oedema have been treated in our hospital over the years using ipsilateral paravertebral needling but by avoiding needling of the ipsilateral limb directly. In practice, we no longer needle an arm in which axillary sampling or dissection has taken place because of the theoretical risk of causing lympho-edema. Lymph-oedema is a challenging symptom and Cassileth et al7 have provided a stimulating article with positive preliminary findings and a prospective randomised controlled trial is planned for further work. In contrast to our practice, the ipsilateral limb was needled in this study. Once established, lymph-oedema is particularly difficult to treat but were one to already have some lymph-oedema could acupuncture theoretically make the lymph-oedema any worse? Perhaps a prospective trial in this area could include a further comparison group without needling in the affected limb. Besides Cancer, palliative care may be needed in diseases like HIV, Congestive Heart Failure, Chronic Pulmonary Disease, Kidney Disease, Alzheimer’s, Parkinsonism, and Amyotrophic Lateral Sclerosis. Now it is proved that acupuncture does helps in reducing of nausea and vomiting which occurs in course of anticancer therapy, better than medicines for vomiting. Patients and their families are most afraid of side-effects of nausea and vomiting due to life-saving or prolonging therapies applied in malignancy patients. Acupuncture is just as effective as the leading medication used to reduce nausea and vomiting after major breast surgery, according to a new study conducted by Duke University Medical Center researchers. The 5,000-year-old Chinese practice also decreased postoperative pain in these women, they report.